We have decided to release the first meaningful teaser for Binary Space’s upcoming game! While we are still giving away very little at this point, we can divulge that the game will be about those rather popular brain hungry zombies. I can hear you groan all the way from Australia, “another zombie game?”. How dare you! …I mean, yes another zombie game! However being a huge zombie movie and game fan I can tell you it will be completely unlike any zombie game before it. I must have wanted to do a zombie game ever since I first saw Dawn of the Dead who knows how many years ago. Then when the new version of that movie came out, shortly followed by 28 days later and others, I developed a bit of an interest in all things zombie and survivalist. I’ve wasted many an hour and much of my own precious brainz playing Left 4 Dead, The Last Stand 1 and 2, and also tried out Pop Caps latest game Plants Vs Zombies, however I can’t understand all the hype surrounding it. I’ve also devoured World War Z (did you know the movie is coming out end of this year? ), The Zombie Survival Guide and numerous other zombie novels. The only thing remaining is to go on one of those zombie walks…hmmm. When compared to existing zombie games, ours will be in an untried and untested genre, with different game play, and quite different graphics. The game has just reached its first playable state, which is quite exciting, and the scariest thing about it is that the game play will present a lot of new challenges that haven’t really been tackled before. Well I can’t say much more but I’m confident we will soon be bringing you zombie madness in a way that should get you pretty excited. The concept art you are looking at here was illustrated by myself (Jay) and it’s one of my first few attempts at any sort of “real art”, drawn using Photoshop CS2 and a Wacom. 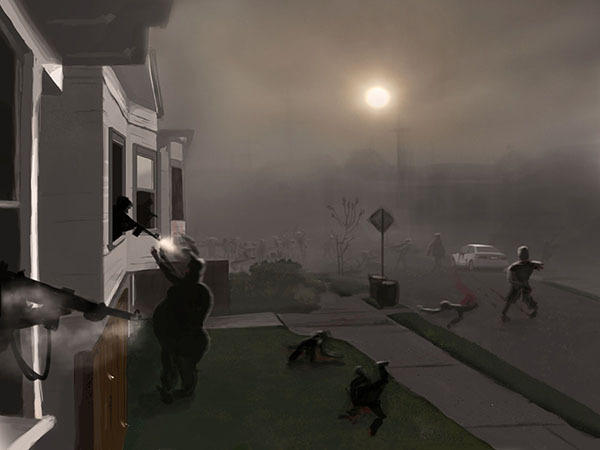 This particular image was copied from a photograph of a foggy street in the US, where I could envisage people leaning from windows and firing out. So I copied the street and then added in the people and zombies afterwards, keeping their forms extremely simple to hide my lack of skills in that department! I feel it works well for the subject matter though, luckily for me! It could probably use another zombie up closer so you really know what they are, but I’m on a bit of a schedule and my skills possibly aren’t developed enough to tackle a highly detailed rotting corpse close up! If you’d like to be notified when major updates are announced or when the game itself comes out, make sure you sign up to the newsletter on the right hand side of the page.